Seth Moulton spoke at his victory party at a hotel in Salem. SALEM — Seth Moulton, an Iraq war veteran and first-time candidate, swept to victory as a change agent for the Sixth Congressional District on Tuesday, denying Massachusetts Republicans their best hope of picking up a seat in the US House this year. With 89 percent of precincts reporting, Moulton was beating Republican Richard R. Tisei, 55.4 percent to 40 percent. Tisei conceded the race around 9:40 p.m.
Moulton, 36, a Marine who won medals for valor in combat, presented a fresh face and untrammeled record to a populace hungry for change. He had already succeeded in ousting US Representative John F. Tierney — a nine-term incumbent damaged by his wife’s 2010 conviction on federal tax fraud charges — in the September primary. Moulton’s win dealt a second loss to Tisei, whose bid two years ago for the same seat fell short by less than 1 percentage point. 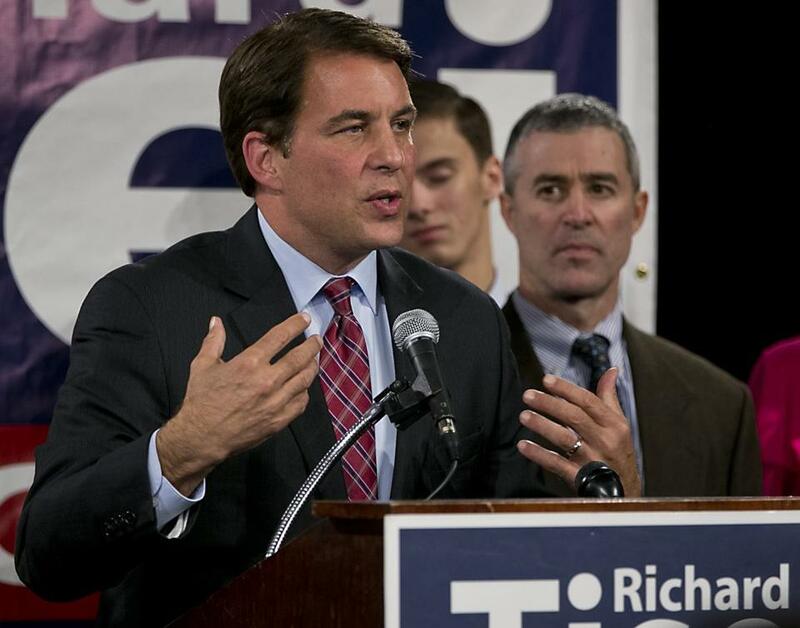 This year, Tisei had been seen as a strong candidate to oust Tierney — before Moulton edged him aside in the primary. 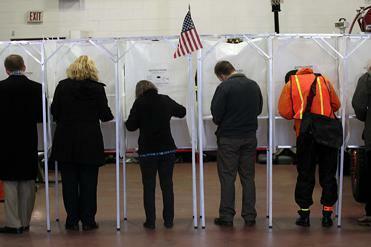 Voters in the state will select their first new governor in eight years. Read: Town-by-town results of the US House race in Mass. With a tinge of disappointment evident on his face, Tisei said he got “halfway there.” The district got a new congressman, just not the one he wanted. Tisei, 52, a real estate agent from Lynnfield who served in the Legislature for 26 years, had campaigned on the theme that he had the experience to deliver results — a message that resonated with voters disenchanted with the state of affairs in Washington, D.C., who were surprised by his decisive loss. But Moulton, like Tierney before him, linked Tisei to the far right of his party, with ads emphasizing that a vote for Tisei would enhance the leadership of US House Speaker John A. Boehner and embolden conservatives such as US Senator Ted Cruz. 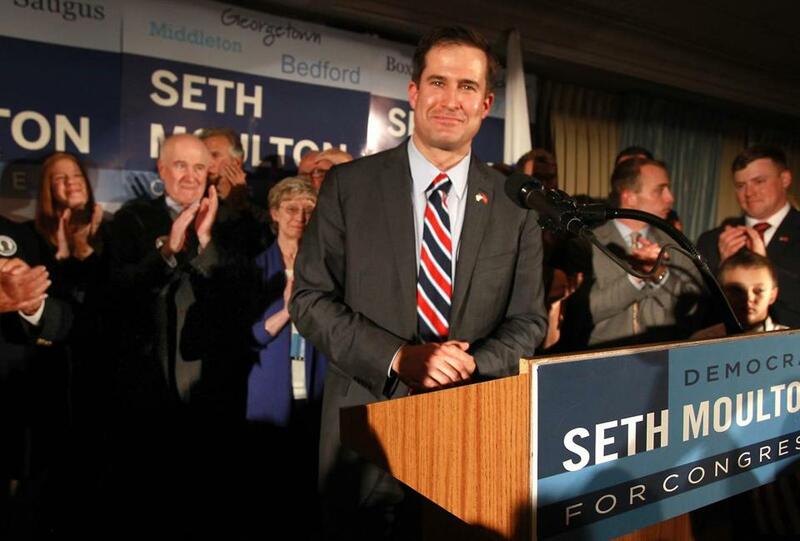 Moulton appealed to voters as a newcomer with an impressive resume, having served four tours of Iraq and graduated from Harvard College, Harvard Business School, and Harvard’s Kennedy School of Government. Alumni connections from his alma maters fueled his early contributions and kept the political cash flowing for months. His campaign raised about $3.2 million, though much of it was spent on the primary race against Tierney. Tisei ran unopposed. Moulton also benefited from a deluge of funds and advertising from outside groups, including VoteVets.org, a political action committee that supports veterans, and the Democratic Congressional Campaign Committee. Though Tisei, too, got help from groups including the American Unity PAC and Congressional Leadership Fund Super PAC, he suggested he had been outspent and that he did not have the resources to respond to all the negative ads confronting his campaign. He raised $2 million for his campaign. “I think we did the best with the resources that we had and what’s done is done,” he told reporters. The supporters at Moulton’s Election Night party at the Salem Waterfront Hotel & Marina included everyone from recent backers to his kindergarten teacher. Richard Tisei conceded after results came in. “It’s delightful,” said the teacher, Barbara Zielinski, who watched him grow up in Marblehead and joined neighbors who put candles in their windows awaiting his return from Iraq. Optimism filled the room, even before the first results turned in. Supporters from across the district, from Marblehead, Salem, and Saugus, turned out to await results. Listen to Moulton’s Boston Globe interview below. The district covers northeastern Massachusetts from the border of New Hampshire down to Saugus, and as far west as Billerica, Tewksbury, and Burlington. The Sixth District contest was the liveliest in the region, and presented the Republicans’ best hopes for an upset. Massachusetts last sent a Republican to Washington when Scott Brown was elected to the US Senate in 2010, but he was defeated two years later by Elizabeth Warren. Massachusetts’ House delegation has been all-Democratic for 18 years, since Tierney toppled Republican Peter Torkildsen and Peter Blute was defeated by US Representative James P. McGovern. McGovern, of the Second Congressional District based in Worcester, was one of six Democratic Massachusetts members of Congress up for reelection Tuesday night but running unopposed. Also unchallenged were US Representative Richard E. Neal of Springfield, in the First District; US Representative Joseph P. Kennedy III of Brookline in the Fourth District; US Representative Katherine M. Clark of Melrose in the Fifth District; US Representative Stephen P. Lynch of South Boston in the Eighth District; and Michael E. Capuano of Somerville in the Seventh District. US Representative Niki Tsongas of Lowell appeared to have defeated Republican Ann Wofford of Haverhill in the Third District. With 73 percent of precincts reporting, she was winning 62 percent to 38 percent. And US Representative Bill Keating of Bourne fended off a feisty challenge from Republican John C. Chapman of Chatham in the Ninth District. With 75 percent of precincts reporting, Keating was leading Chapman, 56 percent to 44 percent. In the Massachusetts US Senate race, incumbent Democrat Edward J. Markey easily beat Republican challenger Brian Herr.